An excerpt from Sam Smith's upcoming book "There is No Next: NBA Legends on the Legacy of Michael Jordan"
There was considerable anticipation for Oct. 26, 1984, 30 years ago today, Michael Jordan’s first regular season NBA game. 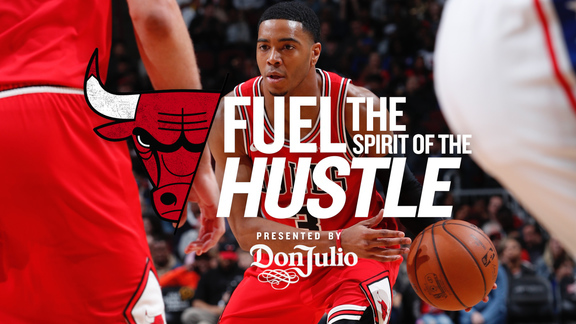 It would not exactly signal what was to come as Jordan had a comfortable 16 points, six rebounds and seven assists in a Bulls 109-93 victory over the Washington Bullets. The Bulls scorers of the day were Orlando Woolridge and Quintin Dailey, neither of whom much passed the ball and Dailey who pretty openly resented Jordan coming for his job. The Bullets were on notice as well about the acclaimed rookie coming off an Olympic gold medal triumph. Jordan was the only Bulls player that night to get a regular double team from the Bullets. Not quite the All-Star freezeout to come, but word was out. Which made what Jordan would accomplish that season even more remarkable, averaging 28.2 points amidst recalcitrant teammates and onerous opposition. There would be one highlight for the fans of plays to come, a full court dash with a behind the back dribble and long armed layup, the hints there of the hang, the tongue, the excitement. In considering the anniversary a year ago, I began to realize there’s an entire generation now who knows Jordan but never truly saw him in his fabulous developmental years leading to the Bulls dynasty and his incredible fame, what sort of person he was and is and how this all occurred. So I decided to write my third book about Jordan, though Sophocles’ Oedipus trilogy shouldn’t be threatened. It’s a combined narrative about Jordan’s effect on society and culture—why there cannot be a Next Jordan no matter how anyone plays and thus the title—and oral history from a cross section of the people there who were involved and impacted by the phenomenon. Thirty years ago today it all began to change. The 1984 Olympics had provided a welcome anticipation for Jordan to the NBA and Chicago. And although NBA marketing was in its relative infancy, the Bulls believed they might finally have something with a take-off on an old Hollywood movie, “Here Comes Mr. Jordan.” That fantasy was about a boxer who died before his time and is returned to the world in another body. So maybe there was something to this Bulls fantasy as the Olympic team’s scrimmages suddenly became otherworldly. “Will it play in Peoria?” is a popular figure of speech to measure whether something, a person, product or perhaps play will appeal to the American public. It has come to supposedly represent mainstream America, sort of the center of the Heartland—the heart of the land—where if you can make it there, you can make it anywhere. It’s also where Jordan, 30 years ago, on Oct. 5, 1984, began his NBA career in a preseason game, the Bulls winning 102–98 as Jordan scored 18 points in 29 minutes. The NBA was more so then, and even today in a sense—though with much more sophisticated international locales—a barnstorming league. It wasn’t unusual even in the 1960s for teams to seek out the fans, as opposed to fans flocking to the arenas. It’s how the most famous game ever, Wilt Chamberlain’s 100 points, was played in Hershey, PA. The Celtics played for many years into the 1990s in Hartford, CT. In the Bulls’ early years, they often played “home” games in Evansville, IN, the Jerry Sloan connection. What Jordan understood immediately, even before he became an NBA star, was that players who were viewed as special owed an obligation to the fans, the community and the game. In many respects, it’s what also made Jordan like Babe Ruth. True, like Ruth, Jordan enjoyed being an entertainer. He was proud of his abilities and eager to if not necessarily show them off to simply put them on display. Like Ruth, whose feats became prodigious and generic home runs of a long distance became Ruthian, it’s similar with Jordan. You’ll to this day hear of someone special in his or her field being called the Michael Jordan of that particular discipline. Jordan would mirror Ruth in many ways with a strong affection for children. Where Ruth, an orphan, would famously visit orphanages, to the point that there would be the myth of promising ill children home runs, Jordan is the greatest ever wish-giver in the Make-A-Wish program for children with illnesses. Jordan’s appetites for life, like Ruth, also became infamous, though more publicized in Jordan’s era, especially Jordan’s prodigious gambling habits. Though condemned in the era’s morality play, it also placed Jordan with the likes of Ruth and Ali, willing to defy society’s norms and conventions and yet become accepted and celebrated. It was an American trait of independence back to the Revolutionary spirit, after all, that endeared him as well to those who wondered what they thought in Peoria. Sure, go for it Mike! Similarly, Jordan understood his responsibility not only to these people, but to the game as well. It’s been a difficult lesson for LeBron James—and many players in this era--to understand. Even for a few minutes. It’s a lifetime memory, as Jordan understood immediately. Not just because it was his first game or the first season, but Jordan played in Peoria as much as he could and pretty much everywhere else in the preseason throughout his entire career. The NBA was hardly the monolith then, even as it’s been romanticized to be with the Magic and Bird era, the coming of Jordan, the Lakers and Celtics in the Finals. The league was staggering into the early 1980s when it became a true partnership between the players and the league with the institution of the salary cap, which probably saved a half-dozen franchises. With payroll certainty after the league had been rocked in the 1960s and 1970s with the bidding war for players with the ABA, the league was able to stabilize and attract new investment. It coincided with David Stern’s elevation to commissioner. Stern’s financial and marketing innovations as well as forays eventually overseas catapulted the NBA into an elite of sports leagues. Of course, it wouldn’t have been possible without the product, the play on the court, which was at its zenith with the coming of stars like Jordan and the corporate embrace. Never has the level of talent been so deep and consistent as it became in the 1980s, with the stars from the ABA assimilating, new ones arriving and the league still more manageable with 22 or 23 franchises. Teams could thus have high-quality depth beyond Hall of Fame level starters. Jordan’s first Bulls team in 1984–85 had high enough quality players with Jordan averaging 28.2 points per game, third in the league, and almost a half dozen top 10 draft picks. But they weren’t even a .500 team, as virtually every team was led by Hall of Famers: Boston with Bird, McHale and Parish, Atlanta with Dominique Wilkins, Detroit with Isiah Thomas, Philadelphia with Moses Malone and Dr. J. Even lesser teams would have multiple All-Stars, like New Jersey with Otis Birdsong, Buck Williams and Michael Ray Richardson, New York with Bernard King, the Bucks with Terry Cummings, Sidney Moncrief and Paul Pressey. But Jordan would begin to elbow to the front of the line. The story of Michael Jordan also is Jordan, Inc., which is the American experience, free enterprise, the ability to sell your product. The product was Michael Jordan. And that he was a black man so readily accepted into American homes and beloved was a breakthrough. It began, as the commercials went, with the shoes. Those were the famous commercials Nike produced with struggling filmmaker Spike Lee, who’d made a low budget film, She’s Gotta Have It, with a Knicks fan, a bike messenger, Mars Blackmon. Converse was the sneaker of NBA choice at the time and what Jordan had worn at North Carolina. Jordan’s representatives and Nike had this plan to name a sneaker for Jordan at a time when it seemed ludicrous. Bill Walton, the Hall of Famer who was a star in Portland, where Nike is headquartered, likes to tell the story of the time he’d met Phil Knight. Nike was successful, but still not the behemoth it would become. Knight said he had this idea of a sneaker named for an athlete and marketed and endorsed. Bill said he told him it was a ridiculous idea and no one would purchase sneakers because of an athlete’s name. That preseason Jordan and Nike unveiled Jordan’s red and black first Air Jordans, the sneaker that, effectively, revolutionized the sports shoe industry. They were laughed at early on as no one had seen anything quite like that. Plus, it was against the rules. Players were supposed to wear sneakers of the team colors. The Bulls’ colors were red and white while Jordan’s sneakers were mostly red and black. The NBA warned Jordan against wearing them, and the team would on occasion be fined. A multimedia movement was brewing as well. With Jordan’s fame, he was appearing on the late night TV shows, crossing over, as it were. He was a star with the smile, the look, the talent. There was a classic bit when Jordan made an appearance on the David Letterman show. He was asked about the shoes and the NBA’s ban. “There’s no white in them,” Jordan explained. “Just like the NBA,” Letterman retorted. With Jordan trying to explain the ban, Letterman deadpanned that it wasn’t because they were so ugly, right? Beauty is in the eye of the beholder, and all that, and kids were yearning for something different. Style was becoming prominent and color was integral. Michael was black, but the world was seeing a rainbow, and it was being reflected as well in the shoes. Sneakers made the jump to fashion, thanks to Michael and Nike. For a nation that needed desperately to begin to look past color. Regular season Game 1, for the record, was in the old Chicago Stadium, October 26, 1984. Jordan scored 16 points on five of 16 shooting. The Bulls won 109–93 as Orlando Woolridge scored 28 points and Quintin Dailey 25. The Bulls lost Jordan’s Game 2 in Milwaukee, and there was symbolism in that one as well. Remember Kobe Bryant hurling up those series of air balls in Utah in the 1997 playoffs? Many said it would break him to fail like that as a rookie. But Bryant was only doing what Jordan did, showing that you can fail because you tried. So there it is, Game 2 of his pro career, the Bucks leading 108–106 and Jordan shooting for the tie. Air ball! Game over. No miracles yet. Two nights later, the Bucks played the Bulls in Chicago. Jordan scored 37 points on 13 of 24 shooting with five assists and six steals. He scored 20 of the Bulls’ last 26 points. The Bulls, 27–55 the previous season, opened with six of eight on the road and went 6–2. In the team’s ninth game, Jordan scored 45 points against the San Antonio Spurs along with grabbing 10 rebounds. The Bulls cooled off after that hot start when they went out west. Yes, that darn circus chasing the team out of Chicago back then, too. They fell to 8–9 heading into Los Angeles. Jordan wowed L.A., home of stars, with the tying and go-ahead baskets in the last minute to beat the Clippers. Then, there was a one point win over the Lakers. And then it was back home for the first Chicago game winner, a 20-footer with five seconds left to beat the Knicks. You know how it goes. Millions will say they were there. Paid attendance was just over 8,000. But Jordan was in the NBA and headed to the All-Star game and loving it. He ate at McDonald’s pretty much whenever he wanted and caught up on TV soap operas—a college favorite—without class getting in the way. He wasn’t the fashion model Jordan we came to know, but a college kid enjoying his dream. He mostly dressed casually in sweat outfits back then, and was happy for a post-practice game of cards or pool. I remember chatting with Jordan early that season and asking him casually how it was going. “The best time of my life,” he enthused.